Once you’ve invested in the X100S or X100 you’ll want to make sure that your camera stays in good working order for many years ahead. Made from a soft and durable leather with immaculate finish, the Premium Leather Case will protect your camera from knocks and scrapes, leaving you free to shoot away worry free. Its stylish looks perfectly compliment the retro-look X100S and X100 advanced compact cameras. With a two-part design, the case makes grabbing your camera for a quick shot super-easy. The base can be left on the camera permanently and allows easy access to the battery and memory card compartment, while the top section can be used to protect the camera, or removed completely. The soft lining cushions your camera and a handy adjustable shoulder strap means you can keep your camera close at all times, ready to take that perfect shot. 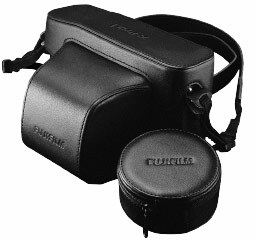 Designed especially for Fujifilm, these Millican bags are made from durable organic canvas, so they’re ideal for travel. As well as being super tough, the bags offer a stylish and convenient way of carrying and protecting your kit. The larger bag, ‘Christopher the camera bag’, includes dedicated storage for your X-Pro1, X-M1, X-E2 or X-T1, plus two spare lenses, memory cards and spare battery. It also features heavy-duty adjustable straps and internal pockets for tablets and accessories. The smaller bag, ‘Robert the camera bag’, takes your X20 or X100S and features pockets for spare batteries and memory cards as well as easy-to-access space for your passport, notebooks and stationery. Choose from Grey Blue or Antique Bronze in either size and carry your kit in style. 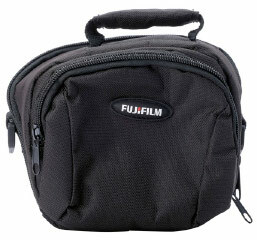 Designed for use with the Fujifilm S6800 and S8200 bridge cameras, the P10NA05900A Bridge Camera Bag is the ideal place to stash your kit and keep it safe from any knocks and bumps. With a reassuring level of internal padding, the bag features a durable zip allowing easy access to your camera so you never miss a moment. Stylish and compact with a fully adjustable strap, the bag also features a separate front pocket, which is ideal for storing essential camera accessories such as batteries or memory cards. The ideal accessory for the adventurous photographer, this handy float strap fixes easily to your XP Series camera and safely keeps your camera to hand, as well as saving it from being lost on the sea bed. If you drop your XP series camera this versatile little strap will float your camera to the surface, no problem! Buoyancy tested for use with your XP70 camera, it’s also colour matched to the stylish design. The strap can be used with the XP60 and XP200 cameras too, with a tough clip to attach the camera to you. A hand-crafted premium leather case that adds style and provides extra protection for the Fujifilm X-Pro1 and lenses up to the XF35mm (with lens hood removed). The leather outer may have a soft-touch, high quality feel but it still offers an ample defence against knocks or scrapes, while the inner is soft-lined for added protection. The case comprises two sections. The top half can be removed completely, while the bottom section remains in place during use. 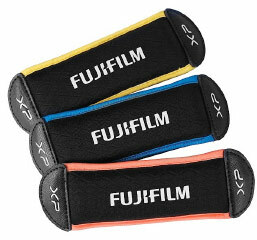 There’s also a lens hood pouch provided, which attaches to the shoulder strap. For a super-fun way to take and share photos, look at the Fujifilm instax range of cameras, film and Share printer. With a stylish range or products available, there’s an instax for everyone. Fujifilm produces a range of high-quality FUJINON lenses specifically designed to deliver optimum results with X-series compact system cameras. Regardless of your shooting style, there’s a lens to suit your needs.